Jerusalem (CNN) -- An Israeli ministerial legislation committee has approved a bill that seeks to toughen the incarceration conditions of Hamas prisoners. The "Gilad Shalit" bill, named after an Israeli soldier held in captive by Hamas in Gaza, would make conditions for Hamas prisoners similar to those of Shalit in an attempt to put more pressure on the Islamist group to free the captured soldier. Shalit has been held captive since June 25, 2006, when Palestinian militants from Gaza, including Hamas, captured him. The militants tunneled into Israel and attacked an Israeli army outpost near the Gaza-Israel-Egypt border, killing two soldiers in the assault. Israel immediately launched a military incursion into Gaza to rescue Shalit, then age 19, but failed to free him. Since being imprisoned by Hamas, Shalit has not been allowed any contact with the outside world, nor any visits by the Red Cross. Details of his incarceration and physical condition remain unknown. The tougher incarcerations of the Israeli bill would deprive Hamas prisoners of family visits, watching television, reading books and newspapers and the option to pursue academic studies. All the above are rights the prisoners have currently enjoyed. The Israeli human rights group B'Tselem criticized the decision. "Holding Gilad Shalit hostage is a great breach of international humanitarian law and Hamas is obligated to release him immediately. 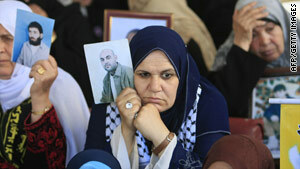 However, Israel cannot take lessons from Hamas on how to treat Palestinian prisoners," the group said. Palestinian Minister of Prisoner Affairs Issa Qaraqe said the prisoners in Israeli jails have threatened to take steps to protest should the new legislation pass. In a letter, prisoners wrote, "(We) will not stand silent about it even if it means running an open hunger strike". Qaraqe stressed the Israeli Government's responsibility for "the deteriorating conditions in prisons," and accused Israel of "exercising political blackmail through draconian laws imposed on the lives of prisoners." "It's about time," Shimshon Liebman, a key activist for Shalit's release, told CNN, "Despite the fact that Israel acts with higher morality standards than our neighbors, it is sadly about time we toughen and change the optimal conditions Hamas prisoners enjoy while Gilad Shalit is closing on four whole years without any visits of the Red Cross or any person we know. No one knows his condition." Liebman urged the families of the prisoners to increase pressure on Hamas to agree on a prisoner swap deal. "We hope that the mothers of the prisoners will start cooperating with us so that Hamas' leaders accept the very generous offer handed to them by the German mediator." According to the Israeli Prison Service some 2,000 Hamas prisoners are currently serving time in Israeli prisons for offenses of national security.